Leaves from 10 to 20 cm, dark green. The leaf is elliptical to obovate, with sharpened base and pointed. Flowers "in beaker", of 5-7 cm, crimson pink colour, from April till July. Horticultural origin: crossing M. kobus x M. stellata. 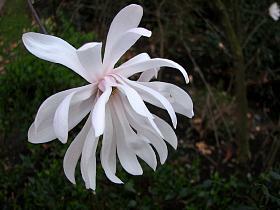 Flowers in star, of 8-15 cm, in April, carrying 10 - 14 petals white, sharpened, sometimes tinted with purple outside.